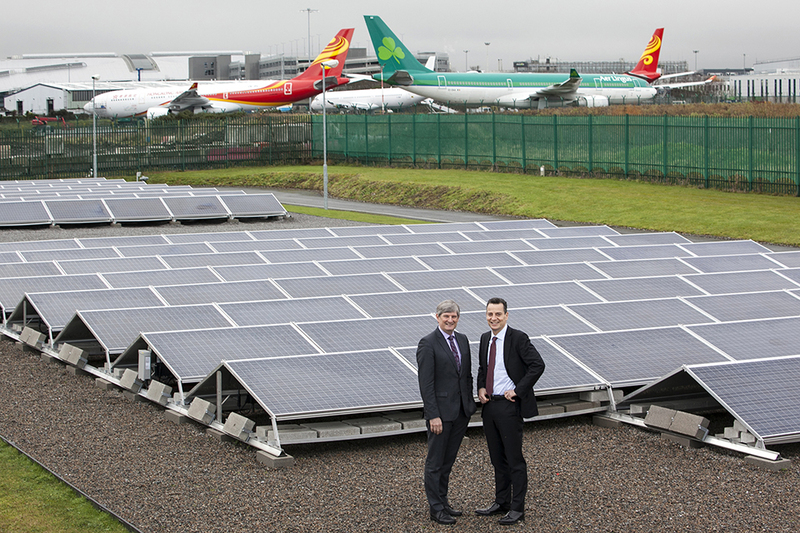 ESB chief executive Pat O'Doherty with daa chief executive Dalton Philips at Dublin Airport's solar farm. Image: daa. An 110kW solar farm has been completed at Dublin Airport, which will provide the facility with half the annual energy requirements of its reservoir system and help the airport reach its 2020 energy reduction targets. The ground mount array was installed by Sun Stream Energy in partnership with the smart energy services division of ESB, the state-owned electricity company, in October 2017. The 268 solar panels are connected directly to the airport's reservoir system which provides 500 million litres of water to both passenger terminals, as well as servicing all the offices and businesses on the airport campus. The panels are expected to generate 88,000kWh over the year, delivering estimated savings of £15,000. Peter Chamber, group head of asset care at Dublin airport, said the array will help the airport meet its official 2020 climate change targets. “We’ve been set targets by government from 2008 to reduce our energy and carbon footprint by 33%. We see renewables as a key way into that in the future and this is our first attempt at moving into that sector in partnership with ESB smart energy services,” he said. This division of the ESB group helps large customers lower their carbon footprint and improve energy efficiency while deliver savings on their energy costs. The consultancy provides capital funding, energy management services and implementation of energy projects for businesses which are large users of energy. Dalton Philips, CEO of daa, added that the company would continue to work closely with ESB to identify further opportunities to use low carbon technologies to continue the work being done at the airport, which has already put it ahead of its targets to achieve the 33% reduction by 2020. “Over the past three years Dublin Airport succeeded in reducing its carbon footprint by 5,000 tonnes, which is equivalent to a 10% reduction in carbon emissions under its control,” he said.